The kids were in bed, Ryan was preparing for his class he was to teach the next day and I was sitting quietly beside him making candy corn beads. He finished up and scooted closer. I somehow convinced him to join in my project. "Too bad we already brushed our teeth," he says as he rolled the second or third candy corn carefully on the table. "Why?" "Because I'd like to eat some candy corn now." This. This coming from a man who will have nothing to do with candy. He asked me to pick up "some meat" from the grocery store one day. "What kind do you want?" "Oh, it doesn't really matter, just some meat." Me, "Ryan, that's like me sending you down the candy aisle to pick up something that looks good." "Oh." Yeah, oh. So, I figured this project to be a complete and utter success when Ryan craved candy corn. I hadn't even completed it. Happy. 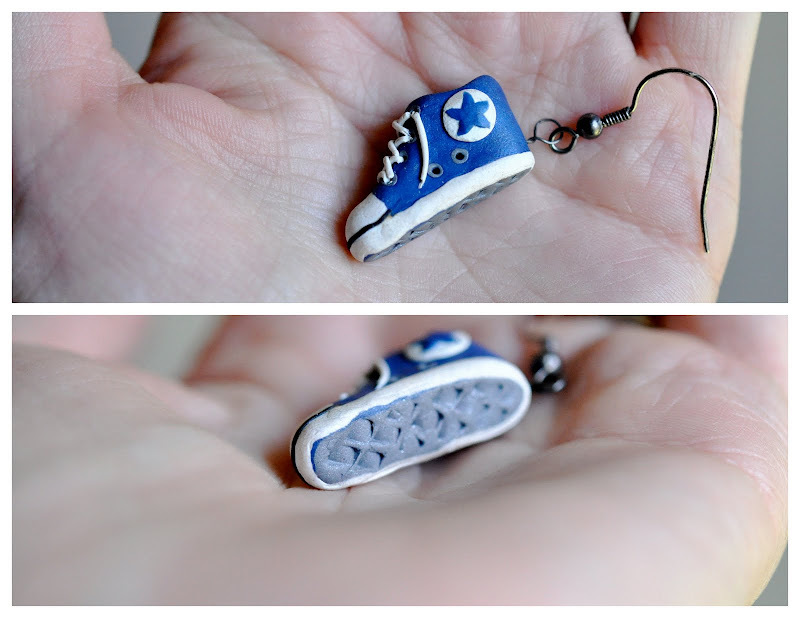 When I was in middle school, I used to make tiny converse earrings out of clay. I'm glad I found a pair to show you. My dad made me approach potential stores all by myself, which was much worse than asking for condiments at the fast food restaurant by myself. I loved making anything miniature. Apparently, I still do. The smaller, the better. Cut the wire into 1" pieces. Fold over the nail, cross the ends over each other and twist the rest of the way down. Take 3 small pieces of yellow, orange, and white clay, about the size of the studs you first wore when you pierced your ears. Remember how boring those were? Stack them together and roll in a cone shape. Insert wire loop. They kept getting smaller and smaller and smaller and smaller. I'm going to use Monday's tutorial for these sweeties. And, I shouldn't have my blood sugar checked anytime soon, although I managed to miss more than I made it. So if you notice everyone getting out their Halloween sweaters and you turn to your closet to find that you don't indeed own a Halloween sweater, do not worry. You're keeping Halloween classy with your Clustered Candy Corn Necklace. I remember all of the amazing little clay creations you used to make! So fun to see a vintage piece of yours! I love your candy corn necklace and I am pleased that you share my passion for this sweet confection. I am attempting to make candy corn colored hair clippies. oh the sneaker earrings! i remember them so well. makes me so happy to see a pair! ...and, i want to eat candy corn now, too. I absolutely despise candy corn (I know. EVERYONE thinks I am crazy.) However, I would make these cutey cute beads in a heartbeat!! Making clay things for various accessories has been something I've always wanted to try. And who doesn't need a candy corn 'something' for Halloween? Thanks for showing how you did it! This made me hungry....for candy corn. Hate candy corn...but I LOVE this. Who would have thought candy corn could be classy? okay I am declaring that you cannot post anything else about candy corn! I have been craving it and it's all your fault! lol This is a great idea though! That is so precious! I've never tried clay before, but for this, I just might! Clever post title and clever necklace! Such a cute idea, Katy! I know I could make one if I had the time but I already bought the materials for the TNHSOCCTOT bag and I need to focus on that. 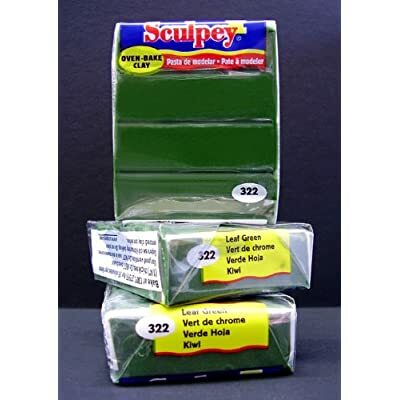 How about listing a few in your shop for those of us who are time-crunched? And the whole time I kept thinking, "ant are gonna crawl on her neck, what is she doing?" I'm still sleepy. What a perfect necklace for fall!! And so easy to make. This is so something that we'd find in the great Martha Stewart magazine!! Oh how creative! Thanks so much, I'll be linking. My first thought was how the heck did she get candy corn to stay on a necklace? Great tutorial!! love that. definitely going to have to try it! did anyone else notice one corn has an orange bottom? Is there a reason for that? loved hearing ben say as he scrolled, "(gasp) i remember those!" i'd never heard this tale. i want more of the story! did any of the stores agree to sell them after your dad made you promote on your own?? I've never been patient enough to do something like this although I always wished I was. You've inspired me to be though... an that's no small feat! I think I'm really going to go make some of these now! Wow, I'm surprising myself right now. Olivia-yes, I sold them in the mall and did custom orders. The above are the ones my grandma bought (blue of course!) that I inherited when she passed away. Mary Beth-so glad I've inspired you! I'd love to see yours. Such an adorable DIY necklace for fall! It's perfect for Halloween!